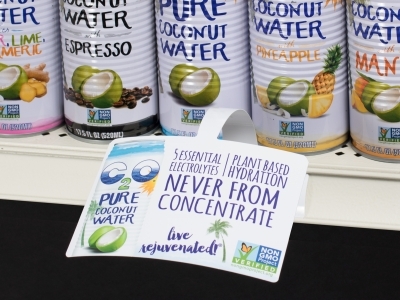 Do-It Corporation provided C2O with two simple and attractive display options for their Baked Coconut Chips and Pure Coconut Water. Both options increase product message along with attention received from customers. Do-It’s PWB Printed Wobbler is an easy way to attract attention in a crowded drink aisle. The wobbler delivers C2O’s attractive branding in glossy full-color. Installation is quick. The wobbler slides into a shelf strip or the adhesive can be used to attach it to any shelf. Do-It’s MLC Printed Header and 2-80 Display Strip get C2O Baked Coconut Chips off the shelf and into store aisles. The MLC printed header provides added product brand message for C2O. Adhered to the 2-80 strip and using a simple “S” hook, twelve bags of Baked Coconut Chips can be displayed anywhere in the store.